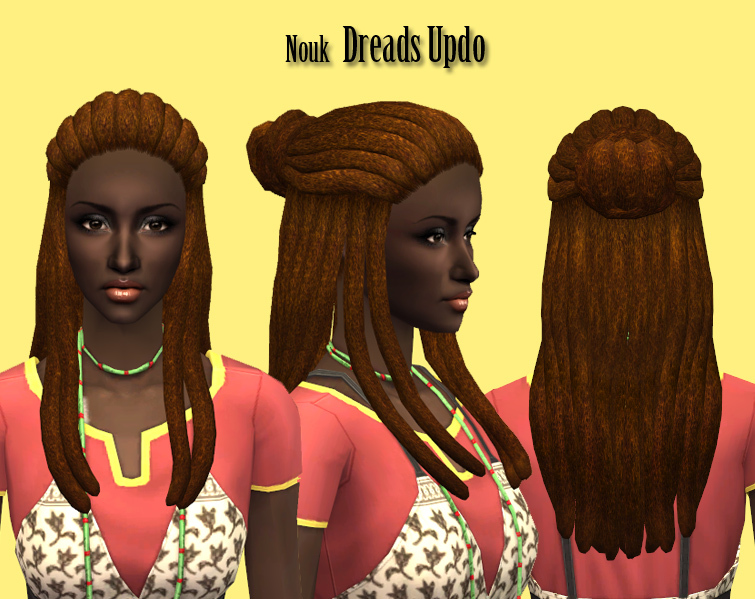 This is an adaptation of the other dreads hairstyle I recently uploaded (Loose Dreads). This hairdo has some dreads gathered in a bun and the rest hanging loose over the ears an shoulders. Thanks for thanking my mom! Oh... and the lovely hairstyle-- thanks for that, too! This message has been deleted by HaphazardSim. I really like this "Updo Dreads" just a bit more than the loose dreads, I just wish the polygon count was not so much. Other than that this is lovely. Squeee! Oh thank you so much! This is beautiful! Sims. Playing god and nursmaid at the same time. Thank you so much! I can never go wrong with dreads in my hood. i'm so glad to see you back again! i love that these dreads are in an updo-it's so regal! thank you! I am sooooo happy to see that you are still creating Nouk! You are my favorite sims 2 hair creator and I love all the dreads that you make! Thank you for this new hairstyle! BLEEDING NEGATIVE: a non-legacy, modern vampire, m/m sims 3 story. Thanks for giving the ladies more variety! OMG anyone can convert this for the Sims 3 ? What a great updo! I've never seen anything in that style, great idea. And the adult model is so, so beautiful! I still hope you'll upload some of your sims one of these days; I love the job you're doing on them, especially the bone structure (I never get that quite right myself). Thanks for those beautiful hair creations! Happy Braids - Braids in a bun for ladies of all ages! Need a Trim? The only close-cropped curly hair you'll ever find.